In 2012, Cape Town’s Executive Mayor Patricia de Lille introduced the Mayoral Urban Regeneration Programme (MURP), focusing on the regeneration of identified areas within Cape Town. The objective of this area-based programme is to uplift communities that have been identified as neglected and dysfunctional, and are seen to be degenerating rapidly. This programme aims to improve the safety, quality of life and socio-economic situation in these areas, with a particular focus on the public spaces. Maintenance of public infrastructure and facilities, in partnership with communities, is the initial focus of the programme, aiming to stablise areas and provide a platform for more effective public and private investment. 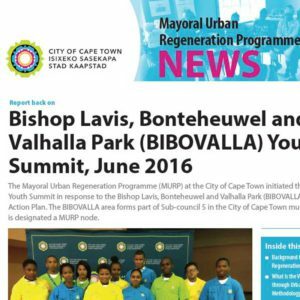 Together with Umtha Strategy and Planning, in 2016 I worked on the co-ordinating, facilitation and reporting on one of MURP’s youth summit project, in Bishop Lavis, Bonteheuwel and Valhalla Park.